Posted on September 19, 2013 | Comments Off on Are You Heart Smart? Most of us take our heart beats for granted but a healthy heart is truly a miracle of nature. Vital to our health and well being, our hearts pump oxygen and nutrient-rich blood to every part of our bodies while carrying away waste products. Last year, over 800,000 Americans died from heart attacks and other cardiac illnesses, many of which were preventable. Although there are risk factors for heart disease that you can’t control, such as family history or age, there are many heart disease prevention strategies that you can adopt right away to reduce your risks. 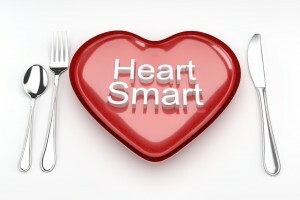 Making smart choices now will benefit your long-term heart health. Do not smoke. Smoking and tobacco use are one of the most significant risk factors for developing heart disease. Nicotine makes your heart work harder by narrowing your blood vessels and increasing your heart rate and blood pressure. Carbon monoxide replaces some of the oxygen in your blood forcing your heart to work harder to supply oxygen. Quit smoking now and within one year your risk of heart disease drops dramatically. Maintain a healthy weight. As we age, our weight gain is mostly from fat not muscle. Excess weight, especially around the waist, can lead to conditions such as diabetes, high blood pressure and high cholesterol. When you lose extra body weight, you reduce the burden on your heart, lungs, blood vessels, joints and bones. Get regular exercise. A habitual exercise program improves cardiac function, strengthens the heart muscle, reduces fat buildup and can make a difference in cholesterol levels. Daily physical activity can increase the length and quality of your life while lowering your risks of heart disease, stroke and diabetes. Inactivity puts you at higher risk for cholesterol problems, blood sugar and blood pressure problems and makes weight management more difficult. Physically active people feel better, have reduced stress levels, more energy and a generally healthier outlook. Eat better. A healthy diet is one of your best defenses against cardiovascular disease. Healthy food choices provide the building blocks for a healthy life. Healthy eating requires planning and preparation but eating a wide variety of nutritious foods, such as fiber rich fruits and vegetables, whole grains, and lean meats, will provide the fuel your body needs to create new cells and the energy needed to thrive and fight disease. Manage your blood pressure. High blood pressure, or hypertension, means your blood is flowing through your arteries with more force than necessary, stretching them beyond their limit and causing microscopic tears. High blood pressure is the single most significant risk factor for heart disease. Uncontrolled high blood pressure can lead to stroke, heart attack, kidney failure and heart failure. Keeping your blood pressure within normal range reduces strain on your heart, arteries, and kidneys. Control your cholesterol. High cholesterol can cause blocked arteries. Blocked arteries can cause heart attacks and can raise blood pressure, which can lead to heart damage or failure. High cholesterol levels can affect kidney filters and cause problems with regulation of hormones and fluids. Healthy cholesterol levels ensure adequate blood supply and aid circulatory organ functioning. Reduce blood sugar. Lowered blood sugar helps protect your vital organs. Over time, high blood sugar levels can damage your heart, kidneys, eyes and nerves. Excess blood sugar puts you at risk for developing diabetes, which greatly increases your risk for heart attack and stroke. Reducing excessive sugar gives you a better chance for a healthy life. The Mayo Clinic recommends regular health screenings so that you know your blood pressure, cholesterol and blood sugar levels. Blood pressure levels should be checked at least yearly and more regularly if your numbers are not ideal. Optimal blood pressure is less than 120/80. Cholesterol levels should be checked yearly at your annual physical starting at age 20. If your numbers are not optimal, or you have other risk factors for heart disease, more frequent testing may be done. Diabetes testing depends upon your risk factors, such as being overweight or family history, and may begin sometime between the ages of 30 and 45 and then retested accordingly. The most important thing to remember and understand about heart health is that many factors that put you at risk for heart disease lie within your power to control. Vessel Care by Metagenics – This comprehensive formula helps maintain healthy homocysteine levels and supports overall cardiovascular health. Cardio Health Formula by Complementary Prescriptions – This formula contains important nutrients for promoting the strength and performance of the heart and circulatory system. Cardiogenics by Metagenics – This product features a synergistic blend of L-taurine, highly absorbable minerals, raw heart concentrate and hawthorn berry to provide nutritional support for cardiovascular health. This entry was posted in Health & Wellness, Health Tips and tagged healthy heart, heart smart, Professional Supplement Center, Vitamins and supplements, www.professionalsupplementcenter.com. Bookmark the permalink.